This book selection came courtesy of my friend Ari. He went to school with one of the authors--either Gina Buonaguro or Janice Kirk who co-wrote the romantic novel together. I'm betting it was Gina as the small bio on the book flap says she was born in New Jersey. An interesting thing to co-write a novel. There are plenty of screenwriting teams, but writing a novel is usually a more solitary and individual pursuit. I thought it was cool that Ari went to school with a novelist (or "co-novelist" if there is such a thing...). It's not easy to write a book. It's not easy to write, period. But Gina and Janice co-wrote a little (209 pages barely! Quite a difference from the massive opuses I've been slogging through lately...) novel about a young woman who meets a sidewalk artist (hence the title...) while traveling through Europe. 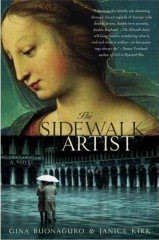 From that short blurb, it seems the perfect set-up for romantic little story--and that's exactly what The Sidewalk Artist is. Blending a bit of art history with travelogue and traditional romance novel, the book spins a yarn about the lasting qualities of "true love." Yes, it's riddled with cliches and is way too simplistic and idealistic for its own good. But my biggest problem with The Sidewalk Artist was that ultimately it has as much depth and substance and endurance as the chalk drawings of its eponymous character. The authors throw some twists into the traditional tale--reincarnated lovers, supernatural soulmates, revisionist history--but all in all I wasn't engaged enough by the characters or writing to care. I did appreciate that they avoided a pat happily ever after ending, but I would have preferred that the journey through Paris and Italy and back and forth between the Renaissance and modern had the evocative presence of Miss Mercy's zippy little fictional travel guide instead of the cribbed cliched shorthand of a hastily scribbled postcard. Isn't your hero description the same cliche, only on the opposite end of the spectrum? The handsome Fabio-esque romance novel hero is a cliche. A Joachim Phoenix anti-hero would play against type--and therefore is NOT a cliche. If you want to read books with flawed, funny and interesting characters, I'd recommend Michael Chabon or Zadie Smith or John Irving over this. But if cliched romance novel types are your thing, then have at it. DWTS Results - We want Winners, not Whiners! DWTS - Good-bye to the Gutte!